Make a statement with this original necklace. It is handmade with thick cotton thread covered by a blue, white and black silk/polyester fabric intertwined with beads crotcheted together in a silk thread. 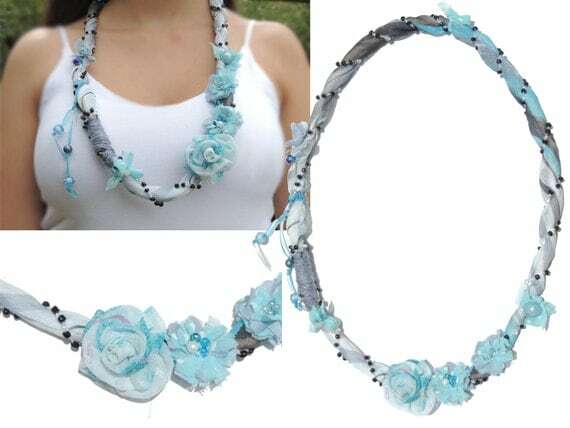 Fabric roses are sewed to the necklace and blue beads hang from a muslin ribon and different beads hang from a cotton-polyester thread. It will perfectly go with both casual and formal clothes. With this necklace you will not remain unnoticed,it’s a great addition to any wardrobe and would make a perfect gift for someone speial. Folksy :: Buy "Yellow Shoulder Handbag With Red Floral print"